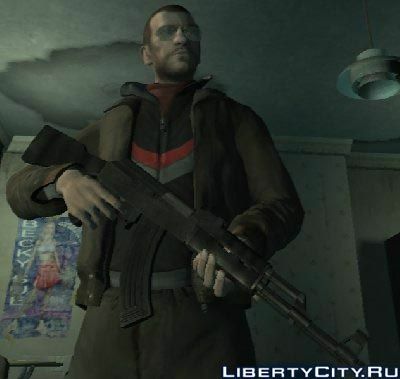 Modification, which changes the texture of AK-47 and improves the parameters of this weapon. Now the game AK-47 shoots like his real prototype. 1/4 Life - AK-74 Texture, Weapon Tweaks. PelPix - AK-74 Bumpmap and Specular map. -Changed AK-47 (AK-74m) rate of fire from ~ 300 rounds / min to ~ 650 rounds / min. -Changed M4a1 rate of fire from ~ 300 rounds / min to ~ 700 rounds / min. -Changed MP5A2 rate of fire from ~ 200 rounds / min to ~ 800 rounds / min. -Changed Micro Uzi rate of fire from ~ 150 rounds / min to ~ 600 rounds / min. -Decreased accuracy of the AK-47 (AK-74m) to be less than that of the M4a1. -RPM changes only apply when aimed. When blind firing (from behind cover, usually using one hand) the rate of fire will return to normal. -Severely enhanced accuracy when blind firing or firing from a car. -Permanently disabled auto-aim on both Keyboard / Mouse and Joystick based controllers. -Increased damage of AK-47 (AK-74m). -Decreased accuracy of AK-47 (AK-74m). Addition to the Red Dead Desert - Reloaded in the form of winter. Теперь калаш похож на РПД.